Cacophonist Peter Geiberger, who passed away last Halloween hosted his final Cacophony event a year ago this month. It was an outing to Salvation Mountain, a folk art site in the desert east of Indio. In the months following that outing, we discussed returning to the desert to accept the artist's invitation to assist in creation of additional structures, but despite Peter's fascination with the place, this never came to pass. Now as the Cacophony Society seeks to rebuild itself, this undertaking seems a perfect expression of that process. 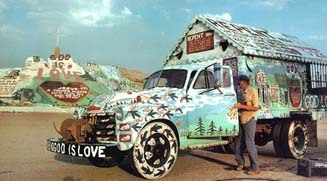 What is Salvation Mountain? Physically, it is three stories of carved dirt painted with Scripture. Spiritually, it is many things, above all one man's individualistic testimony to the Lord. That man is Leonard Knight, a 68-year-old loner who lives with his cat in a painted truck at the foot of the hill. During our last visit, Knight discussed his plans for creating a new adobe structure, which clearly called for more manpower than even he could muster. At the time he expressed great enthusiasm for the idea of Cacophony art lovers spending several days camping out at the site and helping with the project. In recent correspondence, he has provided more details as well as cleared the way for some participants to stay at the nearby trailer community Slab City near the Salton Sea. Currently, we are looking at the long President's Day weekend (Friday night through Sunday afternoon). Cacophonists wishing to participate in this desert adventure should contact us, stating whether they would prefer primitive camping or trailer park accommodations. All participants should try to bring food, drinks, toilet paper, etc., or at least be prepared to stock up in nearby Niland. Knight would also appreciate any donations of paint (bright colors preferred). Please come prepared for a challenge, dirty work by day, sharing and good times by night.